Over the past year or so I've been reading various graphic novels, including a lot of European and oddly, for me, mostly non-manga stuff. Here's a few of them that stick in my mind. Tamara Drewe - A subtle, lengthy graphic novel by Posy Simmonds, about characters in a writers' retreat, and yes, it's interesting and it works! The artwork has a look that many artists producing autobiographical type comics should study - it's not overly complex, but captures the essence of its characters' moods with a few lines and deft technique. Posy Simmonds not only writes beautifully, but "directs" her the actors in this play with great precision. The Arrival - Shaun Tan's masterpiece! I couldn't believe this would live up to the hype but it's even better. I don't need to mention that it's Australian either, this is a work of such lasting importance and breadth of imagination it's essential reading for anyone interested in where the format could be going. Beyond the absorbingly moody pencil and engagingly cute beguiling animal characters is a book also full of heartfelt humanity telling tales of seemingly real people. This should appeal to readers of all ages. 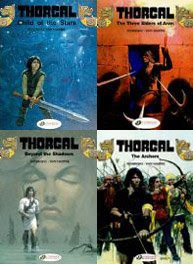 Thorgal - Probably the best "classic wandering hero" series I've ever read. I love the first one with him as a child, paired with the childhood tale of Aaricia, his future wife, in the first Cinebook instalment, though these were originally published later in the series in their original French. Oddly, Cinebook have skipped the "Sorceress Betrayed" (Ice-Queen and Island of the Frozen Seas), to the chagrin of some fans, but are publishing everything else in order. The artwork is beautifully reproduced. I particularly like volumes 1 and 4 of the series so far. The Scorpion - An exciting adventure around religious conflict - strong, action adventure, drawn in the classic comics style. Yoko Tsuno - Adventures of a terrific girl hero (somewhat Tintinesque) that are beautifully drawn and work well until about halfway, where they get overly plotty and confusing, especially for kids. The drawing is impeccable though. Queen Margot - A splendid continuing historical series, if you're into that, though they too get confusing at times, unless read together. Still, one of the finest tellings of history in graphic novel form of recent years. Aldebaran - science-fiction adventure tales, set on a world like, and yet unlike, our own. I like the sense of unexplored frontier in these stories - fascinating and well-written characters and a compelling narrative. Lanfeust of Troy - rollicking sword and sorcery, with fantastic characters drawn in a semicomic style, if a bit bloodthirsty in places. A personal favourite, featuring the usual travelling band of characters. It's akin in style to Roxanna and the Time Bird (more on that series below). Gil St. Andre - well paced murder mystery involving a serial killer, that partially resolves but also continues, with only the first volume translated so far. The Third Testament - A tale of epic pursuit with religious trappings. The careful use and placement of page bleeds are unlike anything I've seen before. Full of dark religious undertones and tension, this is somewhat akin to The Scorpion. The beautiful girl heroine makes a strong central character. Moomin - the complete Tove Jansson comic strip. Being a Moomin nut from childhood, I'd waited a long time to read these in English. The second volume is even better than the first. The prose books are still children's classics as well. Drawn & Quarterly have done a perfect job of compiling and presenting these books, and the third volume is out now. Glister - A fine black-and-white series from Andi Watson, published by Image and recently picked up by Walker Books in the UK. Simply drawn tales of life on the edge of magic, with both artwork and storytelling to my mind recalling Colonel Pewter - which is high praise indeed from me - I wonder if Watson is a fan? The format of clean linework with a single added greytone is perfect for these tales. They evoke a slightly earlier era, reminiscent of British children's stories, each with a few fantasy elements. Glister is an engaging child protagonist and this is the best childrens' graphic novel series I've seen since Andy Ruyton's sublime Owly. The Wind in the Willows - adapted and illustrated by Michel Plessix, retranslated back into English and available as a single, small format US paperback from Papercutz. While I don't like the yellow cover illustration and I could carp about the abscence of "Wayfarers All" (the only missing chapter), Plessix has done a beautiful job of capturing the English countryside, its animal and human characters and the passing of time by the riverside. The line and wash watercolour approach is ideal. I have some reservations about some of the wording, which has been retranslated back into English, seemingly without full reference to Graham's original text, but it reads well in its own right. 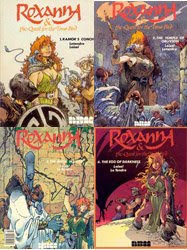 Roxanna and the Time-Bird - While it's a bit disorganised in the telling of the first volume, overall, this intitial four volume fantasy adventure is fantastic in every sense - brilliant art, strong writing and great characters. My personal favourite is the third volume, "The Riege Master," which makes a terrific standalone read. Hmm, no adult American titles on my list :). I have also been keeping up with Australian titles and have reviewed several for Inkspot over the past year, though the online version of the magazine hasn't been updated for a while. Re: TAMARA DREWE - you should also pick up her work previous to that; GEMMA BOVERY. It's excellent. Dillon, I really should do that! I studied Flaubert's Madame Bovary in my Uni course and would be interested to know is there's a link (beyond the name similarity to Emma Bovary). I read Tamara Drewe on your recommendation, so your credit's good with me :).